With four days of testing already completed, teams have a fair idea of what challenges they are facing over the final two weeks. Moving on from Jerez, drivers will get to grips with the Barcelona circuit - a track they should know well, and will be racing on later in the year. Force India will be participating this week, after skipping the Jerez action, but they've confirmed they will be using an older version of their car. McLaren and Honda have a lot of work to do after falling foul of the same sort of early electrical gremlins that all the engine providers did one year ago. Ferrari have shown some signs of early pace, but Mercedes are still looking like the team to beat. Susie Wolff is set to get a day of running behind the wheel of the Williams, and there should be plenty else to keep an eye on as well. Hello there, welcome to the second special Factbyte Factbox, running through the four days of testing, detailing the important stuff, and seeing what lessons still have to be learned. It's time for F1 to head to Barcelona for the first time this year and our beady eyes fall on the drivers for their second week of pre-season testing. Force India are actually turning up to this test, getting their first running of the year, although their 2015 car still isn't ready yet and has been left behind at the factory. Also over the next four days, we'll see a couple of test drivers in action. Ms Wolff has been confirmed for Williams, Jolyon Palmer in the Lotus, as well as Pascal Wehrlein who will oddly be in the Force India rather than the Mercedes. Sauber did a pretty good job during the first four days of testing, showing good pace and reasonable reliability. They even topped the times on day three, although testing pace isn't the best of measures. For a team that scored zero points for the first time ever in 2014, though, it's certainly a positive start! Pirelli are providing a handy bite-size circuit guide, looking specifically at the challenges of the Barcelona track for the tyres. So far we've got a couple of videos from Mario Isola, racing manager for the tyre suppliers. If you missed any of the first week of testing, there's probably only a few things you need to know about. Firstly, you can catch up with the FBFB from those four days in Jerez. Secondly, McLaren Honda struggled from the very first moment. Their lap count was way down and reliability was poor. Honda boss Yasuhisa Arai is under quite a lot of pressure, as you might imagine. He says: "There are many difficulties that we had, but we will fix it and get back to work again. The new engine will be a step up, because we are taking things step-by-step. Some parts will be final parts, but not all. There are several testing parts still, and we will take final confirmation on those just before Melbourne." Just one morning of running completed so far and it's all kicking off at Barcelona. 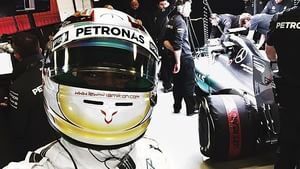 Lewis Hamilton got behind the wheel of the Mercedes but had to stop after less than two hours after racking up quite the fever. Wehrlein was on loan to Force India for this week but has been recalled to the main squad to deputise the poorly Brit. Nico Rosberg is always on hand but isn't getting any extra running in the car. They say down to the workload, but it's more likely in the interests of fairness. Meanwhile, if you had hoped that McLaren could overcome their Honda problems and get some decent running in, then you'll be disappointed. The car hit the ground running and had better pace than anticipated, but that all ground to a halt after 21 laps. Honda's Yasuhisa Arai: "Honda's R&D chief Yasuhisa Arai said: "We had to stop running this morning after discovering a faulty seal on the MGU-K. That faulty part then caused an issue that requires full replacement of the power-unit - and the time needed to make those changes effectively ends today's programme. "We'll need to run a redesigned component to avoid a potential repeat of the problem. Unfortunately, we won't be in possession of that updated part until Saturday, which means that we may face the same problem when we run again tomorrow." Fernando Alonso is due in the car tomorrow, but it's not clear at this point whether the issues will stop him running altogether or just hinder their progress. McLaren say they will plan around it for tomorrow's schedule. At Barcelona, unlike in Jerez, there's an official stoppage for lunch, so the track action has paused for the moment. Nasr leads the way with the fastest time for Sauber but Daniel Ricciardo is hot on his heels. Wehrlein manages to take up both the 7th and 8th slot on the timesheets - one each for Mercedes and Force India - with fellow tester Susie Wolff 9th for Williams. Wolff leads the way on lap counts at the moment, with 77 tours of the Barcelona circuit. There have been two red flags so far and it looks like Pastor Maldonado was responsible for both of them. @Lotus_F1Team: Car back, currently investigating second gremlin of the morning, doesn't appear to be too serious. Talking of red flags, midway through the afternoon, there was a collision between Susie Wolff and Felipe Nasr, with both Williams and Sauber ending up in the gravel trap and needing to be recovered by truck. Susie was very disappointed afterwards, saying: "I was on my out-lap and I guess he was already on a flying lap. I was braking for Turn 5, I stayed on line, and he came across and his rear hit my front. An unnecessary coming together. Very difficult to understand how and why it happened, but it did. These things can happen sometimes. But to lose so much time in the car was really tough for me." So far, there's no word from Nasr but he did complete some more laps after the incident, so not too much damage done. After lunch, Kimi Räikkönen zipped to the top of the times but he was beaten by the end of the day with Pastor Maldonado taking the top honours for Lotus. The hardest working driver was Max Verstappen, with almost 100 laps, but Susie Wolff wasn't far behind. 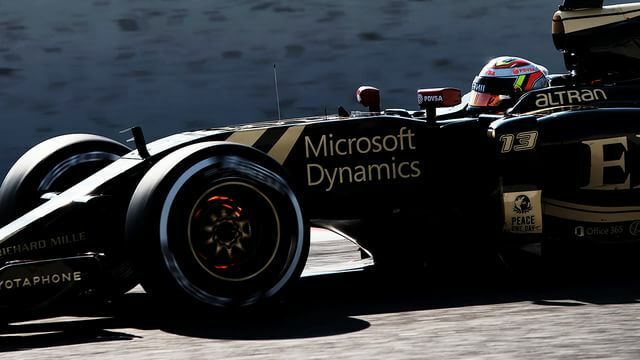 A good start to the second week for Lotus, with the fastest time on day one. It wasn't all easy, though, as technical director Nick Chester explains: "We had a couple of software niggles in the morning then we were able to work through a solid programme of setup work during which we racked up a good number of laps. "The car did have an extended lunch break whilst we changed the clutch, then we were able to complete further work in the afternoon. We’re happy that we’ve made good steps forward since Jerez and we’re working steadily through our evaluations whilst confirming directions for improvement." During the afternoon, Mercedes confirmed that Rosberg sitting today out was down to an inflamed nerve in his neck, which in turn means it's not 100% that he'll be in the car tomorrow. They'll analyse his fitness for testing tomorrow. That explains why Wehrlein was recalled from Force India, which in turn explains why Sergio Pérez had to dash in and use a reserve helmet to drive his car - just plain carbon fibre with no markings at all, or as the team put it ninja-esque. Mercedes' mixed up day meant they couldn't top the table in terms of lap counts today. They also had an issue in early afternoon with the fuel system. Wehrlein said: "Maybe it was not the best for the kilometres because we had some problems in the afternoon and we lost a bit of track time. But at the end I did two more long runs and I think we can be happy." Felipe Nasr's side of the argument: "She was driving quite slow in front of me. I caught up with her at Turn 4, and I did see her moving to the right, so I thought that she knew I was coming. Because she was on a slow lap. Then I committed myself to the braking on the inside at Turn 5. When I was doing the braking I just felt a big hit on my rear suspension. So I think she never saw me coming. "I asked her if she saw me and she said no, she didn’t see me coming. I can’t blame her for not seeing my car, but the teams give information about what cars are around you, and maybe this is information she didn’t get. I don’t know." Considering that McLaren know they are waiting for a part to arrive on Saturday, they're still planning to do some work tomorrow. Their plans are: "Second day of the test – first day in the car for Fernando. With the prospect of limited mileage, the team will look at undertaking some time-intensive bigger set-up changes in a bid to maximise learning about the car’s balance – so expect lengthy breaks between runs throughout the day." The good news is that Nico Rosberg has recovered from his neck injury and was well enough to get some morning running for Mercedes. Lewis Hamilton has also been spotted in the garage, so both drivers are on the mend. It's all about gathering data today, as both Ferrari and Mercedes have bolted sensors to their car. McLaren, who are down on power and waiting for a replacement part due tomorrow, are also focusing on sensors, with some hefty mesh on either side of their car. Jolyon Palmer is in the Lotus today, it took the team a while to get going but he finally got a lap time on the board after a couple of hours. He'd done about 30 laps by the time the track fell silent for lunch. Daniel Ricciardo brought out a very brief red flag first thing, stopping the camouflaged Red Bull at the end of the pit lane. Things picked up for the Australian, as he topped the timesheets ahead of lunch with Kimi Räikkönen second fastest. Fernando Alonso knew he was in for a tricky day in the McLaren, but has managed more than 25 laps which is a very good sign. Less good is the puffs of smoke that seemed to emerge from the car each time it revved up to leave the garage, but one thing at a time, eh? All change at Mercedes again in the afternoon, with Lewis Hamilton arriving in the paddock to replace Nico Rosberg, who was resting his poorly neck. As the Brit said: "I've never really seen that in F1, or even coming up through the ranks, I've never seen both teammates have issues, but it's been good today to get some laps in. I don't know where we stand in comparison to others. I think others have taken a good step, so I guess time will tell." Just a couple of red flags with Carlos Sainz stopping out on track in the Toro Rosso, and Marcus Ericsson wrapping up his day with a last minute halt on the pit straight in the Sauber. Other than that, it was a quiet afternoon. Daniel Ricciardo put in some solid running to get to the top of the timesheets and complete the most laps with 143. Pérez, Ericsson and Sainz also joined the century club - as did Mercedes between their two drivers. Various sites are suggesting different best times for Ericsson in the Sauber, but the team themselves say its .334 so we'll go with that. Testing times are all taken with a pinch of salt anyways. If you were a McLaren employee, you might be starting to panic a little at the state of the pre-season testing so far. Éric Boullier is trying to remain calm though: "We had 12 days to get ready and, if we miss half of the 12 days, we will not be 100 per cent ready. I'm not sure we will have time to tick all the boxes but we will do our best. "It's good to finally put some laps on and get the programme run and push the boundaries back. We are doing more things than we expected today and we are catching up on the programmme. Today has run relatively smoothly." Tweet from @adamcooperf1: Kimi: "The team bosses have managed to put the right people in the right places. It’s early days, but everybody seems to enjoy it more." Sebastian Vettel was back in action for Ferrari today, but got off to an embarrassing start. The German spun his car into the gravel trap on his out lap and got himself beached. It was starting to rain, in his defence. Jenson Button, on duty for McLaren, suffers through the same old story. A handful of installation laps before a loss of power, which led to a ninety minute delay before he could head back out on track. Sauber also had little running in the morning due to a gearbox issue that saw Ericsson waiting around in the garage for his chance to head out. The intermittent rain has kept the track pretty quiet for the morning session, though. Max Verstappen completed the most laps, with 60, and also set the fastest time before the lunch break. Bad news for McLaren, who have found the part they were waiting for today didn't fix the MGU-K problem, and they have to "re-engineer" it all over again. Button had to run with limited power during the afternoon session. 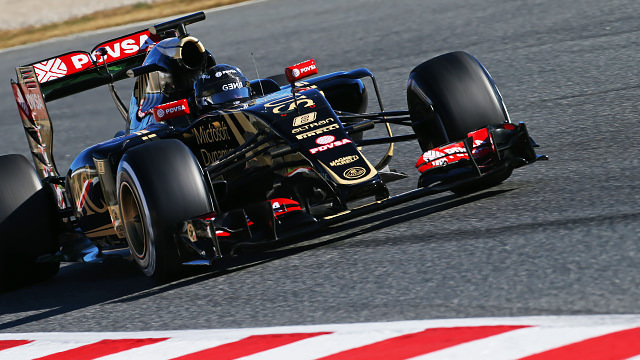 Pastor Maldonado moved back to the top of the timesheets for the third day in Barcelona. Max Verstappen also showed good pace, and he put in the most laps with 129. Unfortunately for Button, it was another slow day for McLaren with just 24 laps. Rod Nelson of Williams is content with the day's work, the team focusing on operations rather than outright pace: "We were expecting rain today so we changed the plan slightly. The day was dedicated to pitstop practice and we ran through various scenarios, issues and problems we may encounter in a race situation. I am happy with the way the team has managed themselves and worked with the issues thrown at them." Red Bull are having a nice quiet week so far, and Daniil Kvyat completed well over 100 laps today: "It was good to follow up Daniel’s total of yesterday with a lot of laps again today. That kind of consistent running is very useful for us and very encouraging. We’re just getting on with the job, making the car better every day and very productive days like today are really important." Despite a tough day, Jenson Button remains optimistic and you might say a little bit defensive: "We are not in for another tough season – that is definitely not the case – but whether we are ready for the first race or not I can’t say right now. This is a very different situation to the last two years – the last two years we just weren’t quick enough, whereas now this is all very new for us. It looks worse than it is, I would love to be pounding around every day that we have the car, but it is just not the case right now." 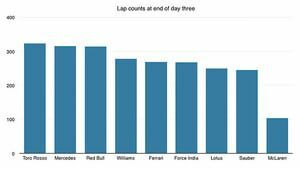 A stark look at how low on laps McLaren are, though, with a total of laps completed in the three days so far. Continuing on the McLaren theme, a nice photo with a few quotes from the drivers in this F1 Big Picture. The afternoon session of the final testing day this week is underway, but all the drama occurred in the morning. Just a few minutes before lunch, Fernando Alonso crashed the McLaren out on track, and was subsequently airlifted to hospital. He's reportedly conscious and talking, and in the hospital for tests. The crash itself didn't look too serious so hopefully these are precautionary measures more than anything else. There was a very early red flag from Nico Rosberg in the Mercedes, the German beaching his car in the gravel trap during an installation lap on cold tyres. Sauber have had a tricky couple of days, with little running yesterday for Marcus Ericsson. Felipe Nasr took over driving duties today but had only managed three lap times by lunchtime, with no time set. The Sauber came to a halt at the end of the pit lane and returned to the garage with unspecified mechanical issues. Tweet from @lsgrcbd (Alonso's manager): Fernando está bien y consciente. Muchas gracias por vuestro interés. Fernando is OK and conscious. Thank you ! Tweet from @Lotus_F1Team: Come on @RGrosjean, it must be time for an afternoon race simulation? Let's see what you've got. The weather is better at Barcelona today, so many teams may go for a long run if they can this afternoon. There were red flags galore in the final afternoon of running. Nico Hülkenberg's Force India ended up on the back of a truck after smoke poured from the rear of the car and ended their running early. Carlos Sainz Jr spun off track, and headed to the medical centre for an all-clear check. The team blamed the off on high winds. Valtteri Bottas also caused a red flag, as did Felipe Nasr in the Sauber in the final ten minutes of the day. Sainz on his crash and the high winds that caused it: "It's not easy to measure, it's not easy for the driver to handle it. One lap it is like that, the other lap there is no wind and you can do it normally. "Unfortunately on one of my long runs with the hard tyre, that is obviously not very grippy here, I lost the car on snap oversteer and I couldn't correct it and went into the wall and damaged the car quite badly." Romain Grosjean put his team back on top, meaning Lotus were fastest for three of the four days. He also completed over 100 laos, as did Rosberg, Kvyat and Bottas. Long running was the aim on the final day. Rosberg also picked up the pace for Mercedes, coming within two tenths of Grosjean's fastest time. I know, I know, the times aren't to be taken seriously but I do so love a gap analysis! Final day's times below. Sebastian Vettel has mixed feelings about his test so far: "We have focused mainly on the car’s reliability, completing some long-runs, and testing various settings and tyre configurations. We could not run as much as we’d like, but at this stage of winter testing there are always some teething problems you have to deal with." It's been an interesting week of testing so far, with early crashes between drivers, to mysterious incidents at McLaren. There's four more days left of the pre-season running before the teams have to go back home and make their final preparations. We'll be keeping an eye on Alonso's progress, he's being kept in hospital overnight for observation, but otherwise all the signs seem to be positive. 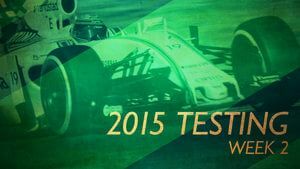 Testing gets underway in just a few days time, with drivers back in action from Thursday 26th February. I'll be back with another FBFB roundup then!